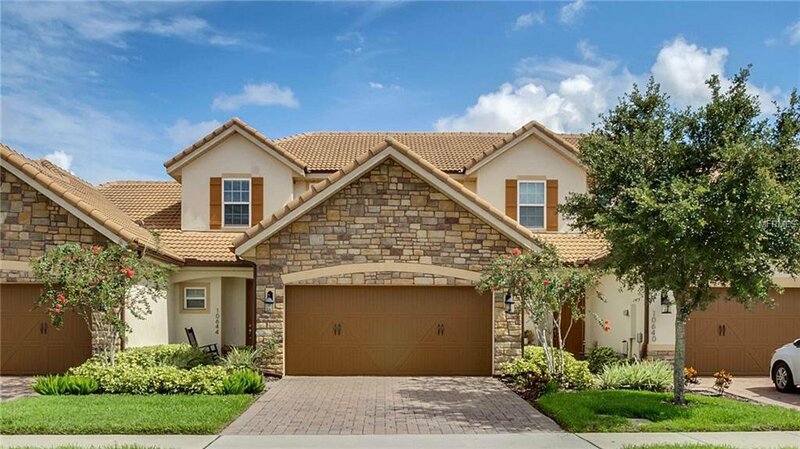 Stunning Mediterranean 4 bed, 3.5 bath townhome in the gated golf community of Eagle Creek. As you pass through the foyer, you enter the great room with kitchen, living room and dining room combination. The kitchen boasts beautiful granite counters, stainless steel appliances, cabinetry with molding and breakfast bar. Retreat to the Master Suite which is located on the 1st floor, dual sinks, granite counter tops, garden tub and separate shower stall. Upstairs you will find the additional 3 bedrooms with carpet. Wonderful curb appeal with a paver driveway, stone accents, tile roof, two car garage and covered entry. Eagle Creek Lake Nona community has tons of luxury amenities like a championship golf course rated 4 ½ stars by Golf Digest, 2-story Clubhouse with pro shop, lounge and restaurant, Family Recreation Clubhouse with Fitness Center, Several pools including one with an expansive sundeck, Tennis courts and basketball court, covered playground and multi-purpose ball field, just a couple minutes away from the VA Medical Center and other Medical City facilities, minutes to the United States Tennis Association’s National Campus with more than 100 courts and state-of-the-art training facilities, convenient access to 417, dining, Medical City and Orlando International Airport. Truly a must see! This townhome is currently rented with the lease end date of 12/31/18. Listing courtesy of RE/MAX ASSURED. Selling Office: IMAGINATION REALTY, INC.